The Wholistic Vocalist workshop by Mathangi Jagadish a.k.a. Ma.Ja was an eye opener for me, covering aspects of vocal health that are often neglected in the journey. 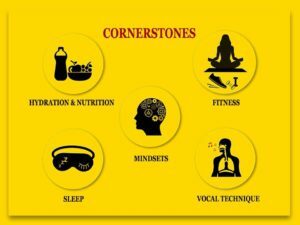 Ma.Ja discussed Mindset, Nutrition, Hydration, Sleep, Fitness and Vocal technique training (including breathing) as the cornerstones of vocal health and wholistic development. Ma.Ja is a playback singer, songwriter, stage performer and coke studio artist with over 475 film songs to her credit. She has sung in more than 18 languages in a career spanning a decade and a half. She has worked with the who’s who of the industry including A R Rahman, Illayaraja, Harris Jeyraj, Leslie Lewis, Prashant Pillai to name a few. She established the WHOLISTIC VOCALIST in January 2017, which is all about creating community to support and guide aspiring musicians on a variety of matters related to the voice. Many of us who are into singing as a hobby or as part time professions can also do with some extra support / guidance and the right encouragement from the right professionals. Developing a 360 degree perspective of your art form could go a long way. Ma.Ja discussed the impact of vocal technique training to improve various aspects such as range, vocal agility, tone, belting, pitching and issues of nasality. This perspective that the instrument (vocal cords) resides inside us, and there’s a very wide range of things that can affect our singing, our craft is very interesting. Unlike a piano or a guitar that can be given away to a repair shop, we as vocalists need to be involved in every aspect of our vocal health and fitness (can’t outsource this). Viewing ourselves as not just vocalists but also as vocal athletes (and at some point also as vocal entrepreneurs) can dramatically change our perspective of ourselves and the way we take action to create transformation. Ma.Ja started with workshop with 20 questions around the 5 cornerstones – intended to help us self assess how well we are at taking care of our vocal health. At the end of the workshop, these come in handy to understand what to focus on. Let me get into a bit of detail on each of the cornerstones based on my understanding. Sleep: Not only do we need 8 to 10 hours of sleep, it has to be good solid sleep. 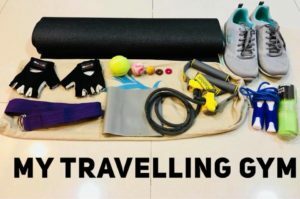 There are several aspects that impact sleep – everything from light in the room, to use of gadgets, to noise, to the food we eat, to exercise… Ma.Ja gave us tips like using light blocking curtains, eye masks, earplugs, and many more points including book references too. I realise that sleep should be taken as seriously as our work or family matters. It’s not a waste of time. I also got to know that mobile phones emit sleep sucking blue light giving the body the signal that it’s time to be awake and alert. Do you need any more reasons to avoid this before going to sleep? Hydration & Nutrition: Though we have heard about having 2.5 to 3 litres of water every day, many of us do not practice the same. I take warm water with a dash of lemon in the mornings – it helps to make me feel fresh. Often times we don’t remember to drink enough water or wait till we are parched. It’s best to sip regularly throughout the day. 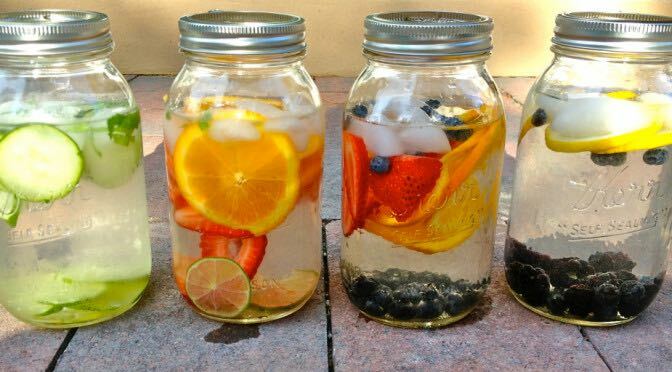 Vitamin infused water looks really pretty. Another way to get a bit more excited to drink water. In the workshop there was a detailed discussion on fresh greens, organic produces, vegan, and different ways to mix things up. and then Ma.Ja had brought a blender and made smoothies with greens – one with banana and papaya and another with banana and strawberry. No sugar was needed. The smoothies were yummy (unlike what was expected of something that is green in colour, LOL 🙂 – nothing as convincing as actually tasting something yourself. There are several options today to buy organic food and fresh greens and vegetables – Ma.Ja shared many inputs on these, including names and numbers that home deliver almond milk, peanut curd etc. By the way, until now, I used to think that vegan is short for vegetarian :-). Fitness: The fact that posture or musculature can affect your voice was rather surprising for me. If you are a person who sits and sings, then you need to be aware that your spine should be aligned. Ma.Ja explained the need to stretch and strengthen different parts of the body involved in the singing. Your neck, jaw, tongue, pectorals, shoulders need to be stretched because these play a crucial role in your singing. Ma.Ja also recommended a speech pathologist who does a full voice analysis, an institute where you can get muscular skeletal analysis and a fitness assessment test done including a posture assessment, she recommended an acupuncturist to effectively relieve those deep rooted tensions. She shared that her acupuncturist was her go to person for coughs, colds and chest congestion. Vocal technique: I never realised that there are so many aspects to understand regarding singing. Singing is a physical activity and several parts of the body are involved. The Breath is a key to good singing. Technique training is about daily practice, till it becomes muscle memory so that you can focus on emoting and connecting with the audience (and not worry about the technique itself). Ma.Ja pointed us to online courses, YouTube channels and Instagram accounts of various vocal tutors and fitness experts to help us understand these better. I also realised that the speaking voice, talking too much or too fast or shouting can really create big issues. Tch, tch. Mindsets: Some of the most common limiting beliefs that hold artists back were also covered. Aspects such negative thinking, comparing self with others, complaining, not feeling gratitude, etc. I have heard about the gratitude journal in multiple forums now and listening to Ma.Ja bring it up too made me realise that gratitude as an attitude is key to several aspects of our artistic development. She also encouraged us to NOT get stress about trying to everything at once and do our best and don’t judge yourself she says. “Dare to be Unlimited” was her motto. Ma.Ja also shared her own vocal health journey and what she learnt along the way. As part of the workshop, she will give you access to her private Wholistic Vocalist Facebook group and Whatsapp group. Through these Ma.Ja shares resources and answers questions. I’m still amazed at how much was covered in such a short time – Ma.Ja is an excellent speaker too. Mind, body and spirit all come together for the vocalist. 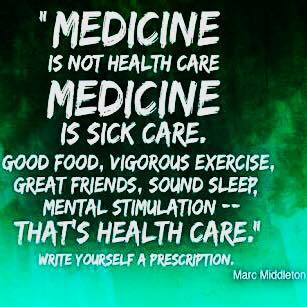 To sum it up, I love this quote by Marc Middleton that she shared. One of the parents whose daughter of age 13, who has been part of the wholistic vocalist group for the past 1 year reaffirmed that the program has impacted her very positively and now she’s also training in vocals and piano with some of the best tutors in the city and has started relishing her artistic journey. 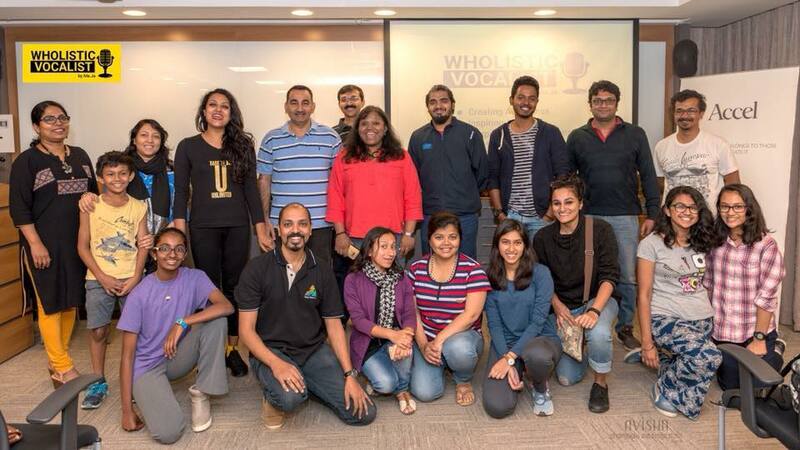 Wholistic Vocalist conducts several workshops throughout the year and Ma.Ja also runs a private one year Master Mind group (5 people) for like minded aspiring musicians to help deepen their craft, get inspired to take action and receive support in their journey of transformation. Check out mathangijagdish.com for more details on Ma.Ja and Wholistic Vocalist.